Whoa, check this thing out. It's almost impossible to believe that such a creature ever existed, but after years of speculation and puzzling over the fossil evidence, researchers from Idaho State University finally figured out how to piece it all together. The end result is this: Helicoprion, an ancient carnivorous fish that featured saw-like spiral teeth called "whorls." Though it looks like a shark, Helicoprions were more closely related to modern chimaeras and ratfish (both cartilaginous fish). 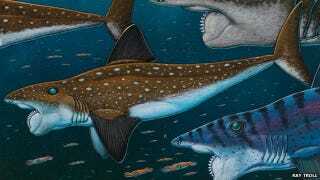 But back in the Late Palaeozoic era, about 270 million years ago, this 25 foot long (7.6 meters) "predatory chondrichthyan" occupied a similar ecological niche claimed by sharks today. And like them, Helicoprions boasted a mouth full of teeth — but theirs were considerably different from what we're used to seeing in aquatic animals today. And indeed, the spiral-tooth fossils had confounded paleontologists who couldn't figure out how the jagged structure, with its 117 teeth, was supposed to work. Some suggested that Helicoprion used it for self-defense and that it was part of its upper or lower jaw — or even located on the dorsal fin. So to solve the mystery, Leif Tapanila and colleagues analyzed the whorl with a CT scan and 3D computer imaging. "When we got the images back, we could easily see that we had the upper and lower jaw of the animals, as well as the spiral of teeth," said Dr Tapanila. "For the first time we were able to very clearly image how that spiral of teeth relates to the jaw." The scientists found that the spiral was connected to the fish's lower jaw, in the back of the mouth. "Imagine that... instead of having a tongue, you have this large spiral of teeth," Dr Tapanila explained. "Only maybe a dozen teeth are poking up out of your lower jaw so you can bite." "The rest of those teeth are stored inside and are not being used, those are your baby teeth - the teeth you had when you were younger." Dr Tapanila said this discovery supports the argument that unlike sharks, which constantly replace their teeth, Helicoprion retained its teeth permanently. Using the computer images, the team could build a 3D model of the jaw, to reveal how the tooth spiral worked. "As the mouth closes, the teeth spin backwards... so they slash through the meat that they are biting into," Dr Tapanila told BBC Nature. "The teeth themselves are very narrow: nice long, pointy, triangular teeth with serrations like a steak knife. "As the jaw is closing and the teeth are spinning past whatever it's eating, it's making a very nice clean cut." The researchers theorize that Helicoprions used their whorls to eat ancient squid. You can read the study in the Royal Society journal Biology Letters.